There are some things we have done on our journey that we have decided to do because, you know what, life is too short and we will probably never come back to half of the places we have visited, its just not realistic (Unless National Geographic or Conde Nasse want to give us a job!). 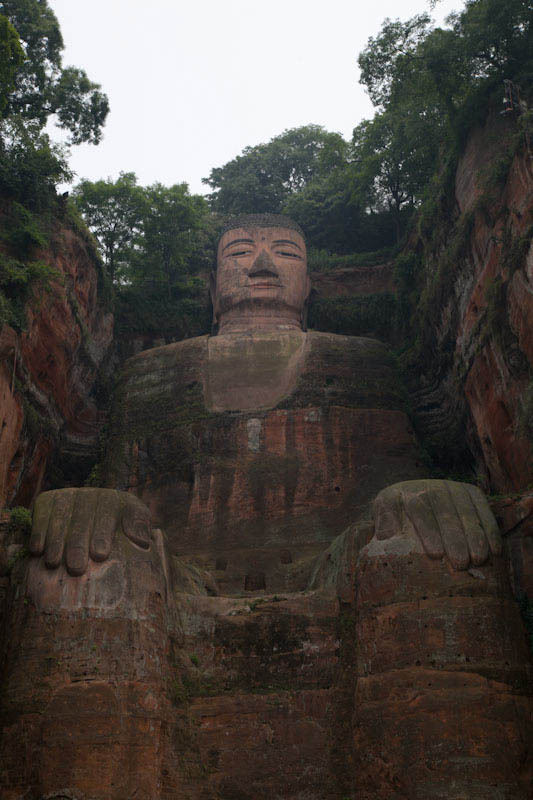 So when we were in Emei Shan, we were presented with the dilemma of whether to visit the giant Buddha at Leshan. This Buddha according to the Lonely Planet was one of the things to see in China, we were apparently only one hours bus ride away but also weary from our trekking on the Mountain which was a serious jaunt for us. This would turn into a day trip and now allow us time to relax, but we felt guilty, the Lonely Planet makes us feel guilty, it has the picture of the Buddha number 15 out of 20 things to do in China, its there taunting us we are so close, yet so far! We broke and decide to go, because “we may never be here again”! This is now a classic McMinien quote! So we jumped on the local bus to Leshan, once there jumped on another bus for a short ride to the centre of town. Once there we started our short walk to the river front, we passed a Walmart which made us chuckle (more on that from Steph later). The Lonely Planet so far had guided well, we were looking for a slow boat for $8 per person and a giant Buddha. We had decided not to visit the park with the Buddha in it as we were not confident the guides prices would be correct after our Xi’an experience and because we had just walked a mountain full of temples, which this park also offered, plus the walk around the Buddha had you 10 metres away, so not a very good position for scale and perspective, in our view. Anyway we got to the river front and only saw signs for the speed boats which were $12, together over half our budget, we somehow were unable to find any slow boats on our side of the river, we walked round the bend of the city and river and got to a point where we could actually see the Buddha, from a distance and at an angle! Bingo there is was! After taking a few snaps we pondered about whether we should bother with a boat, but again the Lonely Planet made us feel guilty and the “we may never be here again”, bloody Lonely Planet, we went looking for a boat. We finally found some slow boats and the price $12 each, again the Lonely Planet had done so well then screwed us right at the end! Anyway, we were not sure where to get tickets so we wandered down the gang plank to the pontoon where a local tour group was already waiting to get on the boat. Sensing an opportunity my future wife (I have decided Fiancée is a naff word Steph is now my Future Wife) moved past the group to the ticket man, he asked for tickets, Steph just said “we were here earlier, we just got some water”, he did not believe us obviously and asked for tickets, we were about to be rumbled when out of the blue a voice behind us said “Yes, they were here earlier, I saw them in the back!” we looked round to see one person from the tour speaking up for us, she repeated the same in Chinese, the ticket man waived us past and on we went! We have no idea if she knew we were blagging it or not but we got on, Result! Now in hindsight if we would have had to pay for this trip we would have been pissed off! It literally lasted no more than 25mins, a 2 min cruise downstream to the Buddha, 10 minutes in which time you are jostling with folks for pictures and then 10mins upstream cruise back to the dock, it was modern day piracy! Well not for us anyway but in principal! Now don’t get me wrong the Buddha is very impressive and worth visiting if you are in the area but for all the kafuffle and $$ cost one would question its rating as a top tourist destination. On the way out from the boat the lady who had supported our cause caught us up and asked about our journey and why we are traveling in China without being able to speak Chinese!? That was a good question but me and future wife like a good challenge, she was Chinese but had lived in LA for 30 odd years. She never asked about the legitimacy of our efforts earlier but she joined the McMiniens Travel Hall of Fame for her heroic support of a free trip for 2 poor travelers!